Early on Sunday, Turkish ground forces crossed the border and pushed into northern Syria’s Afrin province on Sunday, Ankara said after launching artillery and air strikes on a U.S.-backed Kurdish militia it aims to sweep from its border. Turkey sent armored divisions into northwest Syria after a day of airstrikes as part of 'Operation Olive Branch' which bombed Kurdish YPG forces ("People's Protection Units") in and around Afrin to drive the US-allied Kurdish militia from the area. Turkish-backed Free Syrian Army fighters along with Turkish troops are now moving into the area, according to state-run Anadolu news agency. "Our jets took off and started bombing. And now, the ground operation is underway. Now we see how the YPG ... are fleeing in Afrin," President Tayyip Erdogan said. "We will chase them. God willing, we will complete this operation very quickly." Quoted by Reuters, Erdogan also accused some of Turkey’s allies of providing the YPG with 2,000 plane shipments and 5,000 truckloads of ammunition; the comments were clearly aimed at the United States. According to the local military, Turkish forces forces started the ground phase as part of ‘Olive Branch’ in the north-western Syrian region of Afrin, with Hurriyet reporting that the Turkish military has so far faced no serious resistance from Kurdish forces, which has retreated to towns and villages. 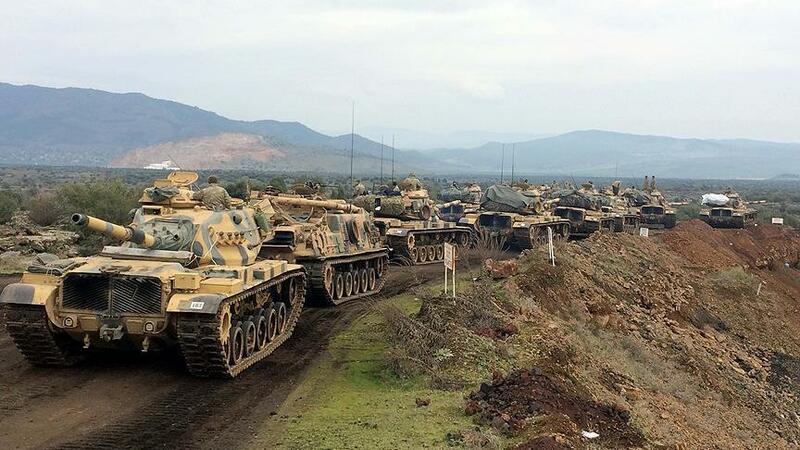 Turkish Prime Minister Binali Yildirim confirmed that tanks and military vehicles had begun to cross the Syrian border, according to Haberturk. They were said to advance roughly five kilometers into the Afrin region. Yildirim also said the Turkish military, NATO’s second-largest, would create a 30-km (19-mile) “safe zone” in the region. Predictably, there have been conflicting reports, with the YPG spokesman Birusk Hasaka saying that Turkish troops failed to cross the border into the Afrin region as they were forced back after a fierce stand-off. The statement was reiterated by another YPG official, Nouri Mahmoudi, who said that “all the Turkish military’s ground attacks against Afrin have been repelled so far and they have been forced to retreat,” Reuters reports. Thousands rallied against the attacks in the border town of Amuda in northwest Syria, vowing to stand against “Turkish occupation”, according to a local witness. At a training camp near the border, about 200 fighters from the Turkey-backed Free Syrian Army factions drilled on a parade ground. Some were in different khaki-colored uniforms, some in jeans and sneakers. Lieutenant-colonel Mohammad al Hamadeen, a rebel spokesman, said a ground offensive was due to begin within hours against the YPG. “The military operation started this morning with the invasion of the northwestern areas of Afrin. And they will start in the eastern area of Afrin,” he told Reuters. A Reuters reporter on the outskirts of the northern Syrian town of Azaz, under the control of rebels from Free Syrian Army factions, heard several blasts and saw smoke rising from a hill to the west, where a fighter said the YPG were. Meanwhile, There were no signs of conflict in the town itself, where life appeared to continue as normal with traffic on the muddy, potholed roads and uniformed rebel police at the main roundabouts. Still, Azaz was bleak and the toll from the war was plainly seen in some of its crumbling buildings. At one of the car repair workshops on the outskirts of the town some men were fixing a gun-loaded vehicle. Finally, the US remains oddly mute on this latest escalation which sees NATO member, and US-ally Turkey, attack a US-armed and backed militia in Syria (whose initial purpose of helping remove the Assad regime is long gone). On Saturday, a Pentagon official said: "We encourage all parties to avoid escalation and to focus on the most important task of defeating ISIS (Islamic State)." The plea by the world's superpower was roundly ignored by everyone.